“Star Wars Rebels” has found great quality again, and they do it by getting rid of the Inquisitors (who were really wasted last season) all together and bringing in a character who existed in the original canon of Star Wars, Grand Admiral Thrawn. Doing this was one of the smartest things Disney could have done as even when the Empire is losing most of the time in small battles, it all comes together in Thrawn’s master plan and a pretty glorious final that shows just how deadly the Empire is since the Death Star or Battle of Hoth. Suffice to say, I loved this season and highly recommend it. The story of Season 3 involves the arrival of Governor Pryce as the new Moff over Lothal and Grand Admiral Thrawn as the new Imperial Agent to destroy the Rebellion in the sector. As the rebellion gathers allies to free Lothal from Imperial Rule Thrawn uses their own strengths against them as his master plan unfolds to wipe out the Rebellion. The Pros: Growing Rebellion Arc – A major arc this season is the Rebellion collecting allies and meeting the leaders of other cells. Whether it is Saw Gerrera on Geonosis, the stupid Iron Squadron, the Twi’lik on Ryloth, Hondo and leaders of the Rebellion like Mon Mothma. This season continues on Season 2 and 1 as the Rebellion Cells are coming together to form a greater fleet so worlds can be liberated. The Mandalore Arc – The Mandalore arc is one in which the Empire is in firm control but slowly loses it as Sabine and Clan Wren become greater power players when she takes on the leader of the Empire on Mandalore, Gar Saxon and makes peace with her family. From here it is decided to fight and Mandalore is thrown once more into Civil War as it is the only chance for Mandalore to exist for Mandalore and not the Empire. This is where Sabine leaves too as she has found a greater purpose beyond the tech. of the Ghost crew. The Fulcrum Arc – Agent Kallus is fully a good guy in this season and his arc is helping the Rebellion and getting information to them until he is discovered by Thrawn. In this we see the Rebellion come to trust him and his arc ends with him officially joining them at their lowest as Thrawn’s battle is a success and the Rebels are routed from their base. Maul’s Arc – Maul’s arc continues the theme of last season of showing how the Dark Side only leaves one alone and resentful of all. By the end of the series all he has is hatred of Obi-Wan and nothing more as he was not able to corrupt Ezra. For a character who really should have stayed dead or died in Clone Wars they at least gave his story a purpose. He is a character who brings about pity as he has lost everything and the Empire is so large and powerful he has no way of gaining back his prior position. He is taking easy outs because if he stays around long enough the Empire will hunt him down. His story is sad and he shows the loneliness of the Dark Side and how empty the quest for power truly is as in the end he dies in Obi-Wan’s arms as Obi-Wan has found peace and a higher cause beyond power and is able to help Maul find peace. The Bendu – Tom Baker plays the Bendu, a force being who is made up of both the Dark and the Light. He is the one who trains Kanan and Ezra and helps them find balance after their losses last season. He is a great character who in the end is hurt by the Jedi, showing that they aren’t good, as forcing him to fight leads to his death at the hands of Thrawn. In the end he was right in a way and in the end the Jedi turning him to the Dark Side and destroying his balance, is one of the saddest parts of the season as it is what leads to his destruction. Grand Admiral Thrawn’s Plan and Payoff – Much of this Season involves Thrawn as the observer, watching the different players of the Rebellion and studying how they fight, discovering who Fulcrum is and developing weapons for the Empire. In the end his plan is a success, though it is isn’t a complete success. He destroys most of the Rebellion on Atollon and forces the Rebellion on the run again. He only loses due to the pride of Pryce and Konstantine who let ego get in the way of results and in order for the Rebels to even survive Commander Sato has to sacrifice himself to destroy a ship at the Battle of Atollon, which the battle that ends this season. Revenge versus Mercy – One of the major themes this season is Revenge versus Mercy and the heart of how the Rebellion and characters should act. We see this with Saw Gerrera and his willingness to kill the last survivor of Geonosis, Cham Syndulla and his willingness to kill and risk his life for the liberation of Rylok and each cases how isolated the characters are when they don’t act with mercy and only want Revenge. It is mercy that turns Kallus to the Rebellion and helps the Rebellion gain allies from Mandalore as well as keeping Ezra’s balance. This theme is universal through the season and gave it strength. Grand Admiral Thrawn – Lars Mikkelson plays one of my favorite characters in the EU, both in the original lore and now the new lore. This is a character who is an alien among an organization made up of humans and because of this doesn’t care about his own ego and pride. He is ruthless and cares about results and it makes sense because he is an outsider. He has a history and we see that he is honorable to as he lets Cham Syndulla escape after Cham is willing to destroy his own home to escape and is the observer. Every rebel victory is a learning experience that pays off. He is unconventional too as he is making Tie Defenders on Lothal and they are shielded ties that the ghost crew has trouble destroying. Because his greatest asset is knowledge he takes out rebels spies whenever we see him and he is the one who traps Fulcrum and nearly destroys the Rebellion, as the Rebels only manage to escape because Kanan angers the Bendu and Ezra brings allies from Mandalore. He is still alive and I can’t wait to see what he does next season. Just as he was my favorite character in the original lore he is now in the new canon. Okay: Empire Needed More Wins – The Empire still needed more wins, and with the dead of Admiral Constantine (a stupid Admiral who is obsessed with glory) is killed in the finale that may happen. Thrawn turns even scenarios were he doesn’t crush the Rebellion into learning experiences that lead to his trap unfolding at the Battle of Atollon. The Cons: Iron Squadron – Iron Squadron is a rebellion run by a bunch of kids. They were super annoying and overpowered. They were the only folks from the Rebellion we meet who clash with the competence and fear that pervades the rest of the Rebellion and allies. I hated this episode, it is the only episode I hated this season. The rest are good or great. Season 3 was a lot better than Season 2 and was much more focused than Season 2 as Thrawn’s overall agenda was revealed at the end and the rebel plans became undone. This was a Hoth moment for the Lothal Rebellion and it was powerful to see what was supposed to be a fleet to liberate Lothal, decimated by Thrawn and the Rebellion forced to run, only just surviving because of unexpected allies. I really enjoyed this given that the Empire experienced mostly losses this season until Thrawn’s trap was finally sprung. This Thrawn is true to his original counterpart in the books in all the ways that matter, and if you were a fan of him in the books, as I was, you will most likely love him on the show. Can’t wait to see how his story unfolds and I hope he survives this series. 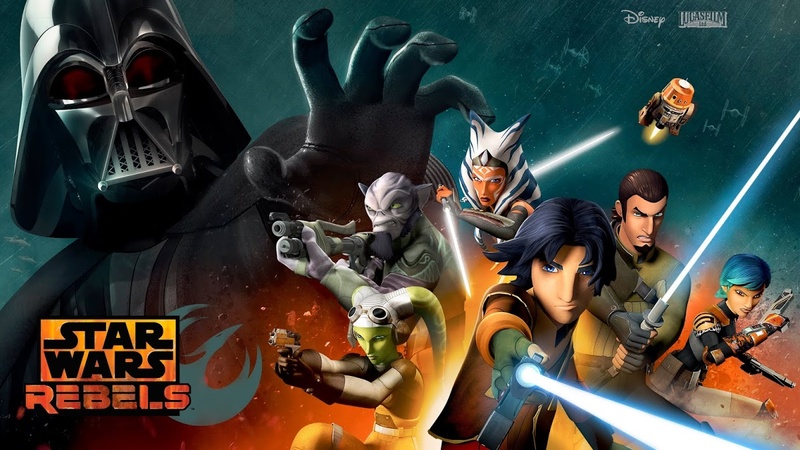 “Star Wars Rebels” Season 2 was a season that started with a lot of promise. “The Siege of Lothal” is one of the best episodes in the series and the promise of it being “The Empire Strikes Back” of the show was a very big claim that initially looked like would be successful executed. Sadly the shows lack of focus, clearly showing the threat of the Empire and poor setup of big payoffs brought the show down overall, making it weaker than Season 1 for me. This doesn’t discount what works though and this show is still a favorite. So without further ado, here is my overall assessment of the show. The Pros: The Animation – The animation continues to be amazing and flow beautifully, especially in regards to the action sequences and giving us what the planets look like. This has never been an issue with the show and continues to be one of the strongest points within it. The Action – The action when it happens is fantastic. The duels between Inquisitors, fights between the Rebels and Empire and any fight that involves Darth Vader is awesome. My biggest issue is the action wasn’t all the tight so that brought it down. 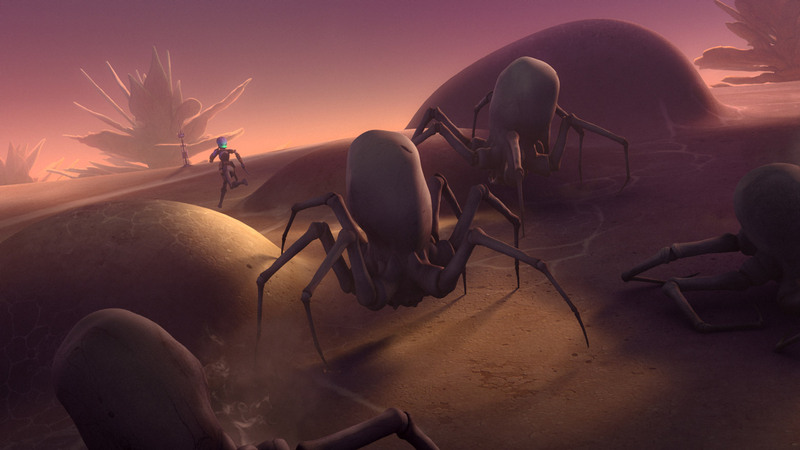 Hondo – Hondo is back and one of the few elements of comedic relief that works as we see his mercenary nature rub off on Ezra and help push him to the dark side in small ways as in helping him and when he helps the crew it shows an ends justify the means mentality that illustrated Anakin’s fall. Captain Rex – Captain Rex is a pretty amazing character and I’m glad they brought him back into this Universe. I’m still hoping he dies so he can get the warrior’s death that would fit his character arc so well…his arc is great in that he and Kanan grow to have a respect for one another as they are both mentors for Ezra. Yoda – Yoda makes an appearance in this and it is awesome! He recognizes his past mistakes with the Jedi order and helps our heroes make peace within themselves. He even reaches out to Ahsoka and is happy to see you. He really was handled beautifully this season. The Crew of Ghost – The crew of the Ghost continues to be where the strongest characters are as we have a “Firefly” type relationship between this crew of survivors as they find themselves pulled into a larger story that they are only pieces in. For this reason, the glimpses of the Universe we get are all the more profound and how it impacts the crew. The Crew of Ghost – The Crew continues to be the strongest part of the show as I’ve come to care about the drama they go through and what motivates them in what they do. Chopper – Chopper is shown to be complex in this! He helps liberate an Imperial droid, we learn he fought in the Clone Wars and the cares deeply for the crew and those around him even though he’s a bit insane. Sabine – We learn more about Sabine’s Mandalorian side and her willingness to do anything to achieve ends even if it means killing. The only reason she doesn’t kill is because she learns from Hera and Kanan who become like a father and mother figure to her. She is a lot of fun and could have done with some more exploration, especially tied back to the Empire. Kanan – Kanan gets some great exploration in this as we see his relationship to Hera’s father who he fought with in the Clone Wars and is a hero and from that how deeply he cares about her. We see him rise in power in this and go through his arc of letting Ezra go and knowing that he can only give Ezra so much training. He connects with the light side of the Grand Inquisitor too which is pretty amazing. Hera – In this we see that Hera is looked down upon by her father who is a hero of his people for fighting in the Clone Wars and is willing to go any means to win. It is Hera who shows him that wider perspective of how allies are their best bet to win the war. She really is a great character and we see her abandonment fears when Kanan is going off to face the Inquisitor as she has already lost her mother to war and in a way her father too. Her character is tragic and strong. Zeb – Zeb is my favorite character in the series and in this he becomes the Hero of the Lasat as he works with the Elders to help them find the original Lasat homeworld. We also see his growth when he connects with Agent Kallus and helps them survive on a dangerous moon. He is a character with depth who manages to bring strength and humor to any situation and is easily one of the wisest characters on the show now. The Empire – I still really like the Empire in this though I feel the writers spent most of this season making them feel weak. This was bad on their part as we were promised “The Empire Strikes Back” of the show and I didn’t feel that at all. If anything, it was more of “The New Hope” based off the Finale. The Inquisitors – The Inquistiors have a cool look and start out strong but become weaker over the course of the series. When Ahsoka easily beats two of them they never recover for it and end being slaughtered by Maul in the Finale. I like the idea of them but they could have been handled as a threat a lot better (same with the Empire as a whole). Agent Kallus – In this season we learn Kallus was a grunt who lost his men to a Lasat Mercenary and that is why he hates them. We also learn the slaughter of the Lasat was not what he thought would happen and he carries guilt over it. By the season’s end he is questioning and alone as he realizes he is being lied to and is just a cog in the Imperial Machine. Darth Vader – Darth Vader is awesome and is the best part of “The Siege of Lothal” and “Twilight of the Apprentice.” His arc ends with him once again killing Anakin so that he can destroy Ahsoka and all his connections to the past. He beats her but we don’t know if she’s dead or not (I hope she is). This season we get glimpses of the light in the overwhelming dark of Vader. The Old Master / Maul – Maul is back and he is awesome! In this he acts as Ezra’s teacher in the Dark Side and is responsible for killing the Imperial Inquisitors and blinding Kanan. He is after power and wants Ezra as his apprentice. It is great to see him again as he’s lost everything to the Jedi and Empire and now only has hate and vengeance to drive him. He survives the destruction of the Sith Temple and is out there still too. Ahsoka Tano – Ahsoka’s arc in this is making peace with leaving Anakin and the Jedi order as we see her fight to avenge Anakin to destroy the monster he’s become in Vader. In the end she chooses to stay with him too as her spirit is broken as she sees the monster consumed by rag and power that Anakin has become. She really is a great character and I like how she never feels comfortable being a teacher because she is a free agent and not a Jedi, just a force user who uses light sabers and the light side of the force. I hope she died, she deserves an awesome death which she got. Okay: Commander Sato – Sato is another character with potential, though I wish he’d die this season. He is the face of the larger Rebellion that connects to the crew and he even gets captured once. Sadly this doesn’t go anywhere as he is rescued and it establishes his respect for Ezra. He is a symbol of Rebel power and that is about it. Ezra – Ezra has great moments when we see him tempted by the Dark Side but he is so overpowering at times that he feels like a Mary Sue at times. It is far to easy for him to save the people and the crew and he doesn’t go through any trial I felt until the final battle at the end. There was a lot of missed opportunities for this character. Other Minor Characters – Sabine’s friend a few others are pretty weak. All they exist for is to show the crew has more allies, and in the process make the Empire even more weak as they can’t seem to kill people who should be dead. At least Ezra’s parents aren’t alive. The Cons: Lack of Narrative Focus – We have fillers, we have a lot of bottle episodes for characters and some episodes that don’t involve the Empire at all. The Empire is set up to be THE threat with the Inquisitors in “The Siege of Lothal,” but it doesn’t go anywhere until the Finale and I blame that on the lack of focus. Filler Episodes – We get a whale episode, an episode where we meet a mercenary who worked with Sabine and a few others that just feel like baggage. All they end up doing is make the Empire look weak and expand the size of the Universe. This season was not nearly as strong as last, though the First and Finale episodes of the season were on part with the best from last season and sometimes better. It was these episodes where the core drama between Darth Vader and the rebels really got explored and the Empire felt like a threat. Outside of that they spent most of this season being beaten by the rebels at every turn. Seriously, the Inquisitors became useless by the end leaving me to wonder how Dave Filoni is going to fill in a new threat for them as I worry making Vader the main threat will just make him as useless as the Inquisitors, which I don’t want. If this show ruins him I’m going to hate this show. That didn’t happen this season at least, and for all of the problems it had, there were some great moments of gold. This was a Season Finale that was powerful in a lot of ways, could have done with more setup but at the end of the day gave us a glimpse into the many faces of the force and how it isn’t as simple Jedi versus Sith…that within the force there are many identities that can be taken and forged as well as showing us the galaxies past is still informing the future that may come. “Twilight of Apprentice” was a 2 part episode directed by Dave Filoni and written by Dave Filoni, Simon Kinberg and Steven Melching. The story involves Ezra, Kanan and Ahsoka traveling to the Sith Temple on Malachor to learn how to fight the Inquisitors. All as not as it appears to be as the Inquisitors are already there hunting another and Ezra finds himself drawn to this mysterious “Old Master” who is not all he appears to be. The Pros: Malachor – Malachor has a really cool look. The Sith Temple is underground and looks like a giant pyramid and around the Temple are dead Jedi and Sith turned to ash by some unknown force. It is creepy and establishes how dangerous this place is quickly. The Inquisitors – The Inquisitors have a great look as we have the Seventh Sister and Fifth Brother return and are introduced to the Eighth Brother who was hunting Maul. They manage to harass our heroes but when Maul allies with them they are killed by him. The Action – There are so many great duels this episode! From our Heroes and Maul against the Inquisitors, to Maul versus Ahsoka and Kanan and Ahsoka against Darth Vader. Each duel means something and helps our characters advance in some way. The Old Master / Maul – Maul is the anti-Yoda in this as he comes off as weak and more intellect when helping Ezra as they enter the heart of the Temple using the power of the Dark Side. He saves Ezra at least once and we see he wants Ezra as his apprentice and to use the Temple as a weapon against all his enemies as the Sith destroyed his people, family and everything he had. Maul is hate and also a smart manipulator too. He survives the destruction of the Temple and we see him flying off hinting that he may return to finish Ezra’s training and corruption. Kanan – Kanan is the protector in this and we see how unprepared he has been to teach Ezra as Maul is able to do what Kanan has been unable, from protecting Ezra from threats, to getting inside the Temple and countless other things. In the end he is still the protector though as even after he is blinded by Maul he is able to knock Maul off the Temple and return to Ezra at the top. Ezra – Ezra is going to the dark side as we see him learn the power of his anger in this and how his training has left unable to protect the ones he loves. 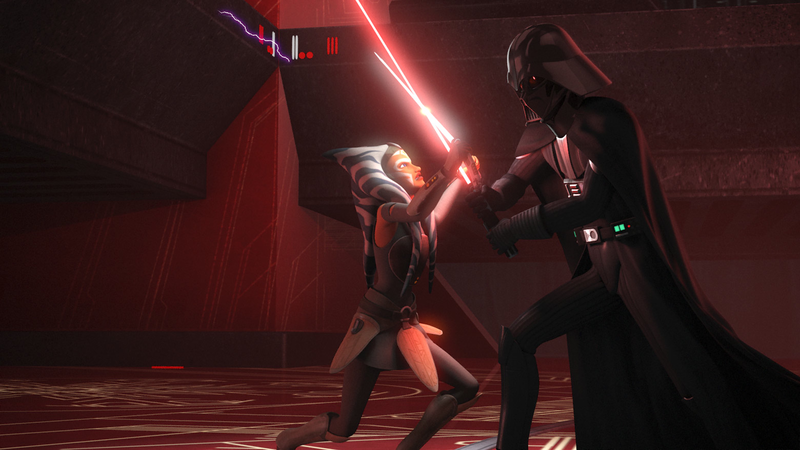 From Ahsoka being defeated by Vader and Kanan losing his eyes to Maul. It is all of this that leads him to using the dark side to open the Sith Holocron at episode’s end showing that he is ready to embrace that side of himself fully. Ahsoka – Ahsoka is amazing! This is the episode where we see how she isn’t a Jedi and that in leaving the order she shaped her own identity as one who is comfortable with Revenge for those she loves (she says she will kill Darth Vader for killing her Master) and we see it has given her great power as she cuts Vader’s mask. In the end her fate is left unknown as she chooses to stay with Vader in the exploding temple. I hope she got defeated and became a force ghost as she chose not to leave Vader, which means her death, just like it did for another character “The Force Awakens” when he chose to stay with someone who had gone dark side. Darth Vader – Darth Vader is a force of nature in this. Maul fears him and will not face him alone, Ezra is beaten down easily by him and the only one who stands any chance is Ahsoka who matches him but also is broken down and is only able to injure Vader when he distracted in trying to get the Holocron from Ezra using the force. In the end he defeats Ahsoka (I hope defeats means kills) and we see him limp from the Temple ruins, the only characters still standing tall and unbroken. 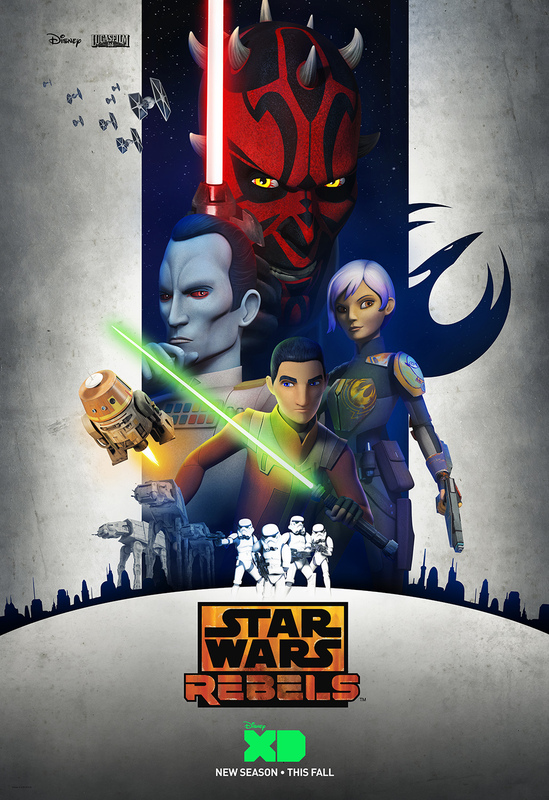 The Faces of the Force – In this we have Maul, a dark side user who isn’t a Sith, the Inquisitors who are tools of the Sith, Vader who is a Sith Lord, Kanan who is a Jedi, Ezra his apprentice and Ahsoka who is a light side wielder but not a Jedi, rather a force user who lives by her own code. Okay: Ambiguous End – We don’t know if Ahsoka is dead or alive as one of the final scenes is her saying she will stay with her Master as they fight one another and the Temple has a Force explosion. The final scenes have Vader limping away and Ahsoka or he ghost entering the Sith Temple. It looked cool but I really wanted a clear victory by Vader, I hope it is Ahsoka’s Force Ghost as Vader would have never left her alive. Okay/Con: – The Story of the Inquisitors – We don’t know who the Eighth Brother, Seventh Sister and Fifth Brother were and now they are dead. They had great looks at least and they put up a good fight in this episode. The Cons: Not Enough Setup – The Inquisitors hunting Maul was never setup, Malachor as a place to go was only vaguely hinted at and Maul came out of nowhere. These were all things that could have easily been established in past episodes rather than us getting filler Space Whale ones. This two-parter is one I highly recommend. It is some of the best from our heroes and writers and we get to see just how diverse identities are within the use of the force. Bringing Maul back worked really well here too, with the only underutilized folks being the Inquisitors whose backstories we never learned, just like their motivations. What really sales this episode though is that exploration of the force and the core relationships between Kanan and Ezra, their relationship to Ahsoka and her relationship to Vader. This core drama drives the story and makes it a favorite episode for me in the end. This a show that has always been about the characters and these episodes are a beautiful illustration of that. “The Mystery of Chopper Base” is another decent run. I felt the fear and anger the crew was feeling was a bit overdone but it made sense when they actually explained why all the characters feel the way they do. I’m really hoping we lose one of our heroes, if not Darth Vader who is appearing later in the series is going to be hard to take serious as a threat on this show, especially as he’ll probably have Inquisitor back-up. This episode is setting up tragedy, now lets see if it goes somewhere. The story was directed by Bosco Ng and written by Steven Melching. The story involves the crew finding a threat at the new Rebel Base Chopper helped discover as they deal with the fear of Kanan and Ezra leaving soon to face the Inquisitors and what it will be like to be without them. The Pros: Sabine – We see Sabine in action a lot this episode as she holds her own against the Spider Monsters and saves the crew quite a few times. She plays an essential role that way. She also nudges Kanan to talk to Hera. Captain Rex – Captain Rex is awesome again, even though he’s mostly in the Zeb role of holding the line (Zeb is nearly invisible this episode). He doesn’t really give any advice but it was great to see him again. Ezra – In this we see that Ezra is okay killing as he talks about killing the Inquisitors as he thinks that’s the only way for them to be safe against the threat. We also see he can’t control all animals (thankfully) and that he is still very new in the force and not over powered (it is sad they had to establish this as it should have been made more obvious throughout the season). I really hope he turns over the next few episodes. Kanan – In this we see a lot of Kanan’s stubbornness and that he is now evenly matched with Ezra. We also see how he deals with fear and anger by cutting himself off from people. We see he is capable of knowing though as we see just how much he loves and will miss Hera. Hera – Hera is in full Captain mode, taking care of the crew and preparing them for when the Jedi leave. This makes her cold at times, but she’s right. I felt bad for her as you see she does have abandonment stuff and Kanan can’t promise her he’ll back when he doesn’t know. She believes anyway and you can see just how much she loves him. The Ending – Hera and Kanan hold each other as Kanan promises he’ll come back (I hope he dies) leaving us with a feeling of foreboding and hope. It was great seeing their love though as you’d have never seen it in the Jedi Order before Order 66. The Cons: Anger and Fear – I felt like there was too much of it and it could have been handled better. Them leaving should have been established the episode after the Inquisitors attacked the Jedi Temple as that was when they knew they had to bring the fight to them or they’d always be hunted. Since it wasn’t established early on, the fighting often times comes off as petulant. This was a great episode, though not a favorite since the characters acting angry and afraid had not been established earlier. There is some great character stuff with Sabine, Ezra, Kanan and Hera though and that is really what carries the story. The animal threat of the episode was alright but it was also sad too that those creatures gave them more trouble than the Empire has often times this season. So I’m hoping that is corrected in the upcoming episodes. “The Forgotten Droid” is a decent episode. 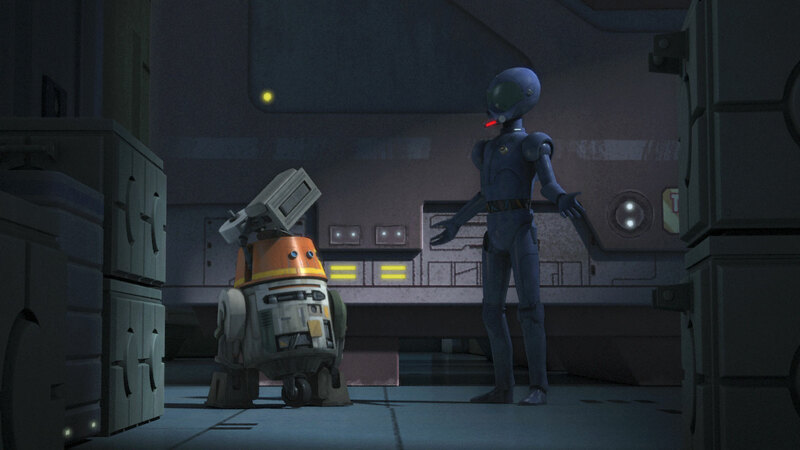 Chopper gets character development and we learn he once served in the Clone Wars, and we also get to meet a pretty cool Imperial Droid named AP-5. What really brings it down is Chopper and AP-5 are not enough to carry an episode and the Empire acting like dolts always brings an episode down for me, and they do that plenty in this one. The episode was directed by Mel Zwyer and written by Matt Michnovetz. The story involves Chopper being trapped an Imperial Freighter when he steals a replacement leg for himself from a merchant. From here the story unfolds as he befriends an Imperial Droid named AP-5 and together they must stop the Empire and help the Rebellion. The Pros: AP-5 – AP-5 is pretty cool, he has a voice that sounds like Alan Rickman and has pride in his protocols and all he does. Seriously, if C-3PO were like this he would be so much more bearable. I liked his character a lot as well as his heroic sacrifice when he sends the rebels coordinates to a space the Empire hasn’t found. He was a great minor character. Chopper – In this we learn Chopper is a veteran of the Clone Wars and has a good side to him as he helps AP-5 rebel and frees him as well as considering him his friend. They have a nice odd couple thing going on and they are both quick with comebacks which makes them fun. It is great seeing Chopper as the hero too since this was just a freighter not a Cruiser. I wouldn’t have believed it if he had won in a major way on his own. Okay: The Rebellion – The Rebellion is okay but we don’t see them follow up with AP-5 at all so it makes them look naive. I wanted to see more of their thought process as they could have been sent to a trap. The Cons: The Empire – The Empire is once again really incompetent and by their downgrading of AP-5 show how they are wasting resources when efficiency should be what they are all about. It just made them look stupid and the Freighter Captain was a one-dimensional idiot who sounded like Pete from the Goofy series. This was a decent episode that is worth checking out. I liked AP-5 and it was cool to see Chopper given more depth, especially as he gives the parts of his new leg to AP-5 to repair him. It is a touching scene and you see the actual friendship that has been formed as they are both veterans and ex-slaves fighting for a new world. “Shroud of Darkness” is more great quality from “Star Wars Rebels.” In this questions are answered and we learn just how amazing the Grand Inquisitor was and is. I like that he hasn’t been forgotten as he was one of the characters who got me into the show in the first place. We also see the Inquisitors acting somewhat effective, which is always good. The episode was directed by Saul Ruiz and written by Henry Gilroy. The story involves Ahsoka, Ezra and Kanan returning to the Lothal Jedi Temple as the Inquisitors continue to find them wherever they go and they want to find out why by reaching out to Yoda. From here the story unfolds as a new layer to the Temple is revealed. The Pros: The Action – The action is great in this episode! From Ezra and Kanan fighting the Inquisitors, from Kanan against the Temple Guards and the Inquisitors rising the Jedi Temple from the ground. This episode is great at showing just how powerful the force is. The Jedi Temple – The Jedi Temple is really fascinating, as this time it revealed another room and with it more secrets. Curious to see how Sidious and Vader use it to their advantage given all the history within it. Yoda – Yoda appears in this episode and offers great advice as we get an idea that he sensed but didn’t understand what was coming and from that warns Ezra of how fear can be healthy but that can corrupt when it turns to anger. He also reaches out to Ahsoka to show he’s proud, which is a sweet moment. The Inquisitors – The Fifth Brother and Seventh Sister are great in this episode. The Seventh Sister finds the Temple and together they do a great job in their fights. Their will only breaks when the Grand Inquisitor appears in his uncorrupted form with the other Guards to face them. It’s a powerful scene. Ahsoka – Ahsoka is dealing with her anxiety over leaving the order and missing her Master Anakin. In this episode she learns what happened as Anakin’s spirit is angry at her for leaving him and that now he is greater and stronger as a vision of Darth Vader appears. It’s really well done and I like that she still has his training videos. She also doesn’t see herself as a Jedi, which is powerful in it’s own right. Ezra – Ezra’s drive is to protect his friends (hello Luke) and Yoda cautions him against letting fear for his friends control his actions. He may have understood but Ezra is such a cipher sometimes that it is hard to tell. I’m glad he got to see Yoda at least. Kanan – Kanan’s journey is letting go of Ezra and letting him make his own choices and from this he earns the respect of the light within the Grand Inquisitor, who appears in his uncorrupted form showing the Temple Guard fell to the Dark Side and that is the reason the Inquisitors have double bladed light sabers. This was one of my favorite parts of the episode and my respect for the Grand Inquisitor grew. What a great character. The Grand Inquisitor – The Grand Inquisitor was once a Temple Guard and the light side within him counsels Kanan that he has to let go of Ezra and let him make his own choices, even if he turns. It’s powerful and he makes Kanan a Jedi Knight. Seeing the good that he was once was before becoming the Grand Inquisitor is powerful, especially since his spirit and those of the other Guards turn on his apprentices the other Inquisitors, stalling them for our heroes escape. Hints at Things to Come – Vader arrives to visit the Inquisitors and he mentions his Master will be greatly interested in the Temple, and when the Inquisitors give their warning he voices that he plans to use the growing power of the Jedi to turn them to destruction and their end. Please don’t mess up Vader writers…do this right, let him win. This was a great episode and is easily one of the best this far. The fact that we get the Grand Inquisitors story and Ahsoka learns the fate of Anakin are powerful scenes and I do hope we see Ezra turn, though I don’t know how it will be tun…he’s too good, though I do hope he turns. The Empire and Dark Side need some wins, Season 2 has been a lot of neutral fights or Rebel Wins. “The Honorable Ones” is a fantastic episode. In this episode we see the extent of how evil the Galactic Empire is, the character of Zeb and that there is much more to Agent Kallus than meets the eye. He’s a favorite character on the show after this. The episode was directed by Brad Rau and written by Kevin Hopps. The story involves Zeb and Agent Kallus forced to work together when after fighting on a base they find themselves trapped on a Geonosian Moon with limited supplies and dangerous creatures with them. The Pros: The Action – The action in this episode is amazing! From our crew facing off against Agent Kallus and his surprise attack on a supposed abandoned base, to Kallus and Zeb facing off against the creatures on the moon. The action is strong and immediately draws you in. Genocide of Geonosis – One of the first things we learn is that there are no lifeforms on Geonosis and that there was something being built around the planet. Given that these were the folks who designed the Death Star, this was probably the Empire hiding Sidious’s ties to the Separatists and all of the plots from the Clone Wars. It is sad and brilliant…the Geonosians were a great species. Agent Kallus – In this episode we learn that Kallus was just a grunt who became a hero simply for surviving and that he doesn’t view himself as a hero, as well as his regret of the massacre of Zeb’s people. It’s powerful as we see that besides his brothers in arms he has no one and is truly alone among the fleet so Zeb’s kindness is something so new to him that he finds himself longing for something he lost in the past wars…his community. Zeb – Zeb shows himself to be a man of honor as he works with Kallus to create a signal that any side (Rebellion or Empire) could pick up. He listens to his enemy and relates him and even offers that his crew take him in. It’s powerful and we see how much Zeb has grown and healed from the wounds that Kallus helped make. The Life of a Soldier – The life of are soldier is a huge motivator for both our characters as we learn it is the community that had in battle that drove them as well as the belief that they were protecting and fighting for a greater good. Kallus’s Dilemma – Kallus is left with the dilemma of leaving the Empire as he has the resources to find out how the Empire destroyed Geonosis, but will he? He’s isolated and alone but he is also a creature of honor and duty. This alone may keep him with the Empire until the end. This was a solidly great episode and is easily one of the best the show has released so far. Zeb is one of my favorite characters and after this Kallus is too. I’ve always liked him as a antagonist and in this we get to see where his motivation comes from and that he is more than just a Imperial stooge. I’m curious if he’s going to change and help the Rebels in the end, or if his duty and honor to the Empire will outweigh the rest.